16th July 2001 - First day's appointment ! Arrival in Fiumicino (Rome), Leonardo da Vinci Airport and transfer courtesy bus from the airport. The only sportmen who will be picked up are the ones who arrive the stated date ( 16th July 2001 ) . If this is not the case the transfer is up to them - Regarding this, each commitee's arrival time must be confirmed. 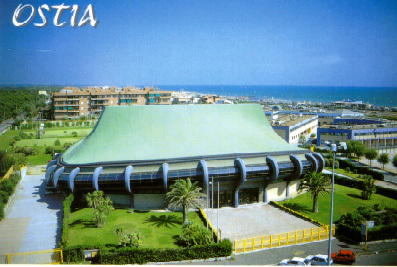 Lodging at the Tourist Village and Camping " Country Club Castelfusano " of Ostia Beach (Rome). In case of arriving be forehand, the commitee should provide its own lodging until fixed date. If the facility of sportsmen or companions that come in choose to stay in private form. It will warn in advance, to be able to reserve the corresponding rooms. If they don't want to stay in private form, the sportsmen and friends will have the lodging and the food that will pay on advance this program, it will be in the facilities of the Tourist Village and Camping " Country Club Castelfusano ", that it is our field of sports. 17 July 2001 : 09:30 a.m. - 13:00 p.m.
Next 12th WJKTWC's year 2003. Appointment for the selection of the new Official Comittee. Exhibition of the Martial Arts referres according to regulation. Afternoon : 18:00 p.m. - 21:00 p.m. Opening Cerimony of the event. Host of Italy and IMAFD Flags. Italian National an them, with translation in International Sign Languages. Demostration show : Sportsmen from foreign countrys will carry out a Demo for the audience of all martial arts. End of the evening of the ceremony, Welcome to all representatives for the Buffet and Drink Party ! 18 July 2001 : 09:30 a.m. - 13:00 p.m. Afternoon : 15:00 - 18:00 p.m.
Fights competition for free weight category "OPEN". 19 July 2001 : 09:30 a.m. - 13:00 p.m.
KARATE DO - Male and Female Divisions. Afternoon : 15:00 p.m. - 18:00 p.m.
KUMITE - Fights Competition for free weight category "OPEN". 20 July 2001 : 09:30 a.m. - 13:00 p.m.
TAE KWON DO - Male and Female Divisions. WUSHU / KUNG FU - Male and Female Divisions. End of the manifestation : 18:00 p.m. - 19:00 p.m. In the evening we will go to Party of celebration's restaurant, give out the diploma prizes and Directing Committe of International Martial Arts Federation ( I.M.A.F.D. ), will deliver a speech. 21 July 2001 : 10:00 a.m. - Day last arrangement lodge PALAFILPJK and accompaniment of visiting on varied historic monuments and Good-bye for 2003 by in the same city selected . THANK YOU IN ADVANCE & WELCOME TO YOU AS SOON ! This price are inluded for injury insurance !